Colour pigments (anthocyanins) are drawn from the skins of the grapes.Grape juice is clear, including (almost all) red varieties. Tannins are mainly drawn from skins and seeds of the grapes. They affect mouthfeel (puckery, dry, and rough sensation), act as antioxidants, and improve aging potential. They contribute bitterness and astringency to wines. Aroma and flavour compounds are mainly bound to other compounds in the juice and are set free by yeast enzymes during fermentation. Certain yeast strains have different enzymes which release specific aroma and flavor compounds during fermentation. Proteins, pectins and minerals are sources of instability that cause cloudiness, haze and precipitates which must be dealt with during winemaking. The transformation of sugar into alcohol (ethanol) by wine yeasts (Saccharomyces cerevisiae). 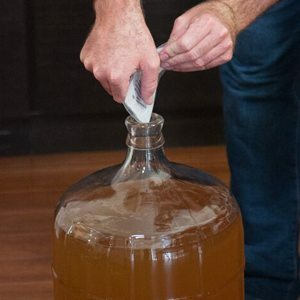 Alcoholic fermentation is complete when specific gravity (SG) ≤ 0.995, or as specified in the instructions for the style of wine. Incomplete alcoholic fermentation can cause refermentation in the bottle!! 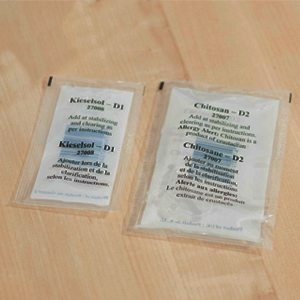 Most kits use a SINGLE-stage fermentation process where the alcoholic fermentation is completely carried out in a primary fermenter (i.e. pail). Stabilization is the process of protecting your wine from microbial and oxidative spoilage before and after bottling. 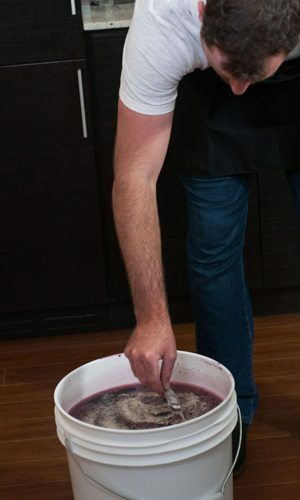 Leaving the stabilization process out of the winemaking process will prevent your wine from lasting more than a couple months in bottle before either turning to vinegar or refermenting in the bottle. Clarification is the process of removing haze causing proteins and polysaccharides prior to bottling. Clarification will take between 7 and 10 days and will prevent your wine from going cloudy after bottling if performed correctly. Sulphur dioxide (SO2 ) to protect wine from harmful oxidative effects as well as from yeast and bacterial spoilage effects. Sorbate to protect wine from renewed alcoholic fermentation, notably used in wines with residual sugar. Other wine additives to protect wine from impediments such as precipitation of tartrate crystals. Fining agents to help precipitate proteins, pectins and other colloidal matter that may affect clarity. Racking to separate wine from precipitates.